Not sure about you, but as a kid I was ALWAYS told that tracing was for losers. I think you have heard similar, that tracing is for the weak, the lame and the artistically inept. That tracing has no value; is useless. Now is there an ART to tracing? Of course there is! That's what was in the title wasn't it? haha! How is tracing useful? And in what ways is it actually educational? ***Before we hit that: in what ways is tracing still cheating? If you take a finished work and you simply redo what has already been done, that's not what's meant to be learned. The idea isn't at all to recreate what they did. Now, I know what you're thinking: You said trace! Trace means… well… TRACE. Haha, and right you are. But give me a moment to explain myself. The idea is to understand HOW the artist draws. Get into the mindset. 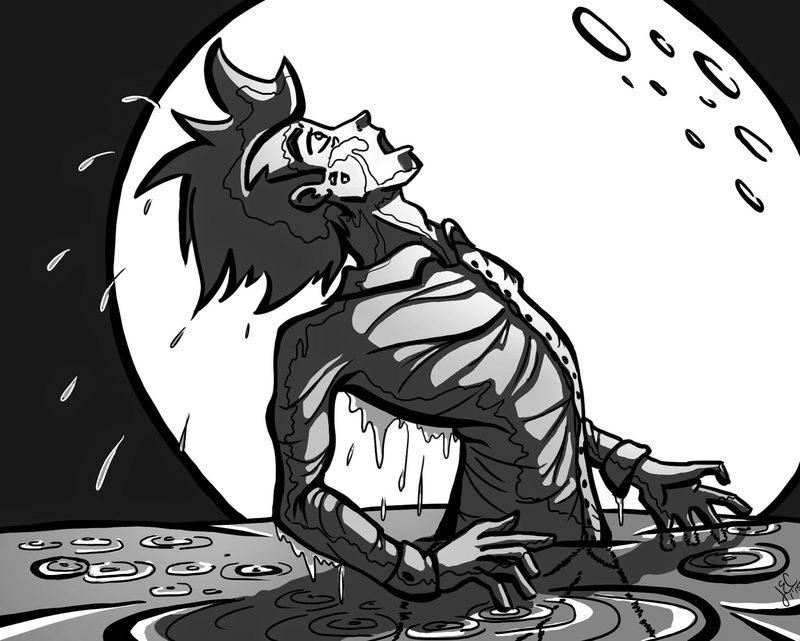 It's like dissecting and re-imagining the way that they draw. The technique. The freedom. The hand set. The flow of the wrist. What lines came first? How did they start this? Where are the 'planning lines'? The structure lines? You're plan is to mimic the hand of the master. And do it again. That's what I meant by 'recreate' what they did. You're not in it for that. You're in it for the techniques. My biggest suggestion: finished works are Not the best way to learn with this style of… well learning. Don't take paintings for example. I mean, sure you can, but it's not the best way to trace learn. In my opinion. The best is the sketches. If you can find the sketch blog of an artist that you love, that's an excellent start. If you can't find that, you can always go for ink work. That's another great one. Why you may ask? Because these sketches leave in the original foundation lines that the artist used to plan! That's what you want to grab at! Where was it rough? Where did they know what they wanted and commit? So draw over it, and then erase it, draw over it again. This time, fewer strokes. Don't 'back and forth' like the student draws. Confidently make a mark. If it's wrong, do it again. And again. Do it til your sick of it. Then mirror the sketches and do it again. Turn off the base layer, and look at just your art and trace your sketches of the original. You think I'm crazy? I thought I was stupid nuts too when I started. But man, can I tell you a secret? So for all of you awesome artists out there that already know tracing is fantastic, I have some fun little things to think about when you trace next. 1. Who is the artist? What was their job/place in the pipeline? This answers basic "who" questions. 2. Where in the process did this fit? Early sketches? Finals of the character? Rough facials? Body testing? This answers the "when" questions. 3. How old is the master? How many years have they put into this? This answers the "insecurity/inequality" feeling more than anything. 4. Who is this character? Age? Gender? How did they define that with this sketch? The eye shape perhaps? Proportions and shape theory? This answers the "Creativity" questions. And 5. What can I use in this to my sketch? What techniques do I want to use? How do they define their __________ in a way that I can too? What effortless lines can I use over and over again? Application time!! What other things could I add to this list? Can you give me 5 more to make it to 10?? 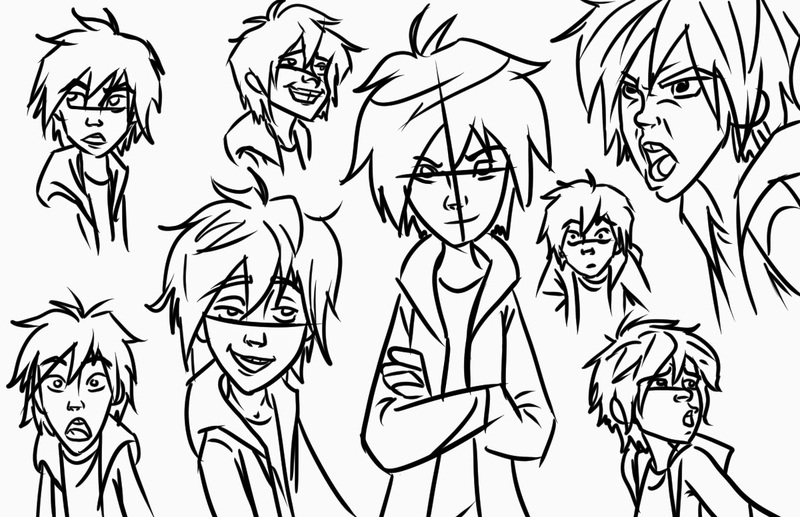 Here's some sketch-overs/traces that I did of Hiro Hamada from Big Hero 6! 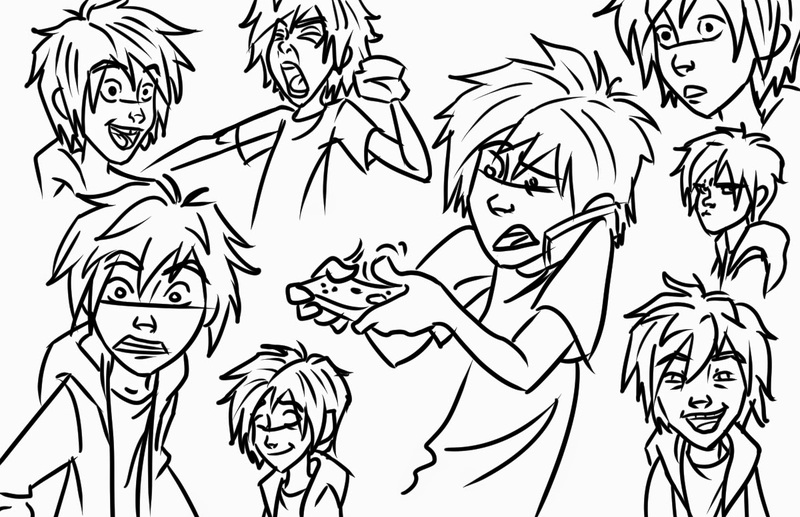 I can't tell you how much I love these sketches. The artist who did these had such effortless lines. And ease of facial expressions and anatomy!! Ahhhh!! The love. THE LOVE. PS As always when you trace, these are not my work. I mean, the trace is, but the originals are made my someone fantastic. First sketches are my understanding phase, you can see I have to apply my way of drawing: use of a circle and then a build off from there. But I realized that it was not what was done for these at all. My investigation sketch phase: which lines were first, where is the emphasis? Which lines are a crutch to me? Where do I need to free up my own line work? The trial and confident stage. They're as close to the originals as I managed (yet haha), with a style of myself thrown in because I was becoming more confident. There's no crutch used on these, simply understanding. 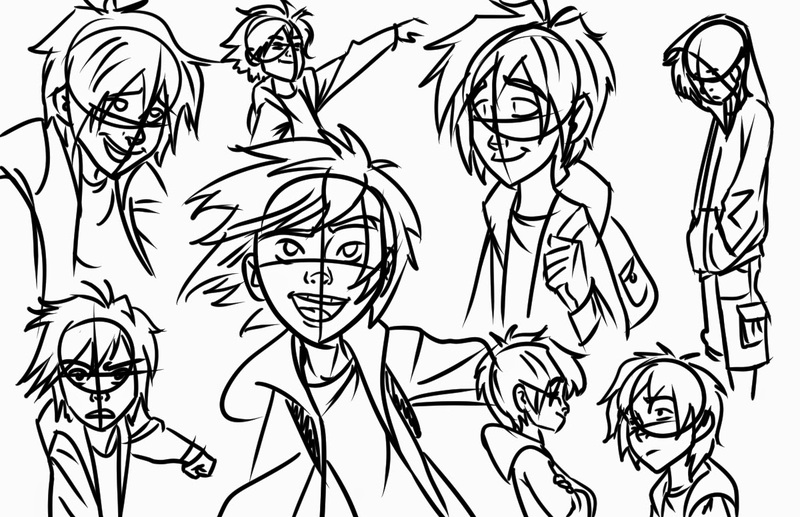 These are drawn with Hiro's jaw line and the one simple line across the eyes setting the rest of the head. No circles needed. The build out for the hair is a spacial understanding of Hiro's head in space. Something that I am NOT great at yet. Notice the looseness? Another thing, these are much easier done. There isn't multiple lines done for the face. One swoop. Something I will work into my own style for certain.